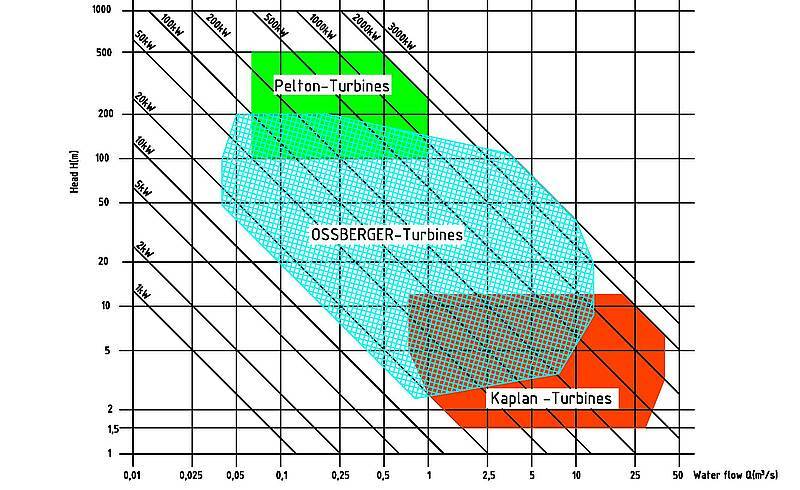 Use the following chart to identify your turbine requirements. Note how the Ossberger crossflow turbine is used across a wide range of head and flow combinations, making it a versatile and often more cost effective choice for most hydro schemes. The Ossberger turbine operates over a wide range of flows resulting in higher energy output over the year than other turbines. The operating range flow range, at maximum efficiency, of an Ossberger crossflow turbine is the minimum design flow to 6x the design flow. Find out more about crossflow turbines here.